The year was 1987. New Edition's future was in question. Bobby Brown had departed. Rumors had surfaced that lead singer Ralph Tresvant was planning on pursuing a solo career. The group's remaining three members, Mike, Ronnie & Ricky, had voted singer Johnny Gill into the group to pad the potential departure of Ralph. The result of these moves will remain in our memories (and ears) forever. New Edition released Heart Break in 1988 and arguably one of the biggest hits from the album was Can You Stand The Rain. The original ballad took the hearts of every New Edition fan as well as everyone else. Fast forward to 2017... 29 years later... the urban dance mix of this classic is remixed by yours truly. This is one of my all time favorite New Edition songs and I really wanted to put it back in people's heads. I kept the original song 99% intact (with minor alterations) but added a more uptempo beat to it. Can You Stand The Rain (urban dance mix) can be downloaded right here or at djdiamonddog.com free of charge. You can also stream both the audio and video here, as well. I urge everyone to take a listen to this one, especially if you're a New Edition fan. DJ's... the download contains an untagged 8 bar extended mix for your sets. Thank you for your support. Heathens was a worldwide smash hit, topping the Billboard charts in over 25 countries! Heathens is an alternative rock song with a very mellow vocal approach to it. Pushed by the hit movie Suicide Squad, Heathens found itself peaking at #2 on the US charts along side the group's other hit, Stressed Out, from their 4th studio album Blurryface. How do you enhance a song with this much power? You cross it over. Since the video takes place inside a prison, what background beat would work better than Akon's Locked Up? Take this fundamental sound and include a verse from a 90's hip hop icon ( Tupac Shakur) and you have a hit that touches on the hip hop genre as well as pop/rock. The download is free and you can access it by clicking here. The download link includes 8 versions (clean & dirty, extended clean & dirty acappella clean & dirty, instrumental & an alternate version using the beat from I Got 5 On It by Luniz). Can't wait to download it? Then stream it right here or at djdiamonddog.com. Are you more of a visual person? Then I got you covered. You can also check out the Heathens (Locked Up Mix) video. Country music has long been an American tradition, from Willie Nelson and Johnny Cash to Brantley Gilbert & the Zac Brown Band. Country music, in the new millenium, remains popular in the mainstream with artists such as Sam Hunt and Florida Georgia Line hitting the number one spot in the Hot 100. The new age country has adapted and taken sounds from different popular genres such as rock and even hip hop in order to give it a new edge sound. It's definitely not the sad songs that were being released 50 years ago. The new country is much more upbeat. It's been 8 long years since I dropped my last country megamix, which was used at a fireworks display, so I have decided it was time to put another one together. This one consists of both country, country rock and southern rock. 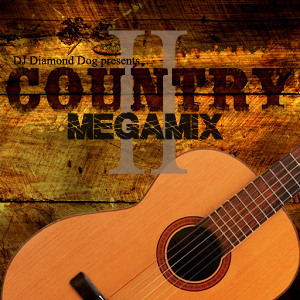 You can check out the Country Mix II by streaming it here. If you want to listen to it locally, you can download it for free here. Summer's almost here!! So check back for more new mixes at djdiamonddog.com!